There are many slot machines out there that take players into the extravagant life of the rich and famous, this game does that, but instead of rich people, it will take players into the life of a rich and a sophisticated fox family. This is why all of the symbols that land on the reels and the lines are inspired by Foxes and their extravagant way of living. 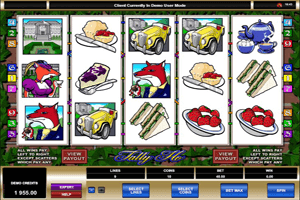 Play Tally Ho Slot here. The symbols that appear on the 5 reels and the 9 lines of the game include a rich male fox smoking a pipe, a rich female fox drinking team, biscuits, desserts, a fox family insignia, a huge mansion, a tea pot and cups, cheese, a fancy vintage car and much more. Although the game has 9 lines only, it offers players high payouts whether through the regular line payouts or the special features and symbols that can help players get paid greatly. For example, there is the wild horse symbol that will help players get paid by substituting for the rest of the symbols on the lines and reels. It will not only do that as it will also double any winnings whenever it succeeds in creating a payable combo. There is also the golden scatter horn that will give players great multiplier scattered rewards as well as triggering the free spins round. This round gives players 10 spins for free.